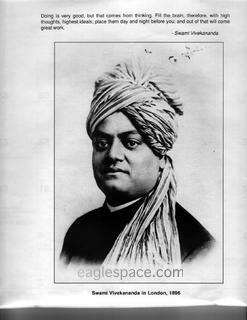 Swami Vivekananda was a great teacher of the Vedas and Vedic thought, and of the Upanishads in particular. His lecture on the Vedanta (Lahore, 1897) outlined several key concepts of Hinduism and clarified a lot of misconceptions regarding the Vedas and the Upanishads. According to Vivekananda, the three Prasthanas are considered to be the three important pillars in the study of all the systems of Hindu religion. The Upanishads, the Vyasa Sutras and the Bhagavad Gita have been taken up by every sect in India that claims Hindu orthodoxy – whether dualist or advaitist, Shankaracharya or Ramanuja or Chaitanya. The theme of the Upanishads can be viewed as an attempt to find an ultimate unity among all things. “Knowledge is nothing but finding unity in the midst of diversity”. The goal of the Upanishads is to find unity in the midst of infinite variation in “this marvelously diversified universe, where prevail infinitely different names and forms, in matter and spirit – each thought differing from every other thought, each form differing from every other form”. The Upanishads make this task (of finding unity in diversity) a little bit easier by using the idea of Arundhati nyaya (the law of Arundhati) or the proximity principle. The easiest way to show someone the small star Arundhati is to first show them the big brilliant star nearest to it – and then slowly shift their sight to the smaller star. Almost all the Upanishads begin with dualistic teaching, Upaasana. God is first taught as some one who is the Creator of the Universe, its Preserver, and unto whom everything goes at last. He is one to be worshipped, the Ruler, the Guide of nature, external and internal, yet appearing as if He were outside of nature and external. This is remarkably similar to the central theme or holy grail of all science – to find unity in the midst of diverse physical phenomena! It is remarkable that Swami Vivekananda was indirectly discussing the scientific concept of “the unified theory” of quantum physics in 1897! Many of Swami Vivekananda’s lectures show that he was a strong proponent of the fact that “any religion worth practicing has to stand up to the scrutiny of science”. The second pillar is the Hindu philosophical system, of which, the Veda Sutras of Vyasa have the greatest prominence. This is because the Veda Sutras are considered to be the consummation of all the preceding systems of philosophy. Swami Vivekananda suggested that the philosophical systems preceding the Veda Sutras are not contradictory to one another. Instead, one is based on another, and there is a gradual unfolding of the theme which culminates in the Veda Sutras of Vyasa. The Bhagavad Gita is the third pillar of the Hindu system. It is a divine commentary on the Vedanta and forms a bridge between the Upanishads and the Sutras. This third pillar is the most widely read book among all Hindus, and is perhaps the most readable and “relatable” of all Hindu scriptures. Have you read the Bhagavad Gita yet? What is your favorite Hinduism scripture? Please share with us in the comments below. ke prakaar saare vishva ‘Hindu’shabd me aajaata hai. samaan jnaanaamrut (mokshdaayini) doodh pilaane keliye bulaarahi hai. ‘Ashvini’ devataaye saare sasya raashi ke ‘adhidevata hai’. maanava varga ko ek ‘aalingaan’ me samet letha hai. Is mantra ‘Vasu’ shabd ashta vasuvon ka sanket karta hai. ‘Vasupatni’ unka ‘shakti’ ka sanket hai. ‘Ashta vasu’ vishva vyaapak hotaa hai. anusaar bhi ‘Dhenu Yantra’ mein Poorna roop ka Gayatri Mantra hi likha hai. Isiliye ‘Gomaata’ Hinduonko puujaneeya hai. bhe baaki hai. Samaya ke anusaar kam kardiya hai. bahut aadar karte hain. Is vichaar dhaara ko jo be maanta hai woh pratidin praatah kaal me Go maataka poonch ki taraf kadhe ho kokar bhakti bhaave se is mantra ko paath kana chasashiye. Taaki saare vishv me Atma jnaanaamrut prasaar ho aur saare vishva saubhaagyashaali ho. (Aap is mantra ka vistaar vyaakya janana chaahete hain, usko bhi chahe to upload karsaktaa hun.